The Flinders Archsocks have been available for purchase for a short time. The idea of the ‘Archsock’ came from illustrious beginnings. First suggested by the eminent Associate Professor Dr Heather Burke of Flinders University in 2012, it was only a short time before they went through development to commercial enterprise. Selection criteria for procurement of the socks were largely based on design, comfort, durability, local manufacture, and cost. In the design a typical sock style was critical. A local supplier (South Australian) was required to provide a product with an opening at one end, enclosed toe end, a slight bend in the middle to accommodate the heel, and most importantly the product focus: ‘Flinders Archsocks’ emblazoned above ankle height, caressing the lower calf. Colour was not a prime consideration; however, the newly formed Colour Coordination Committee (CCC) determined the light blue motif on a dark blue background met the criteria of striking visual appeal and archaeological flamboyance. Initial sales were encouragingly high. This was expected; however, it was soon apparent the socks were not field tested. Consumer response indicated the comfort experienced was favourable in leisure activities, but durability and comfort in the working environment were in question. Testing the socks in a typical field environment was necessary. The aim of the field experiment was to test the comfort and the durability of the Flinders Archsocks. The test was conducted in three phases. Each phase of the experiment reflected typical working conditions of the archaeologist. Phase one tested conditions experienced throughout the travel period. This is the period of time whereby the archaeologist is required to sit for extended periods of time, with minimal movement. Motion is often limited to rotation of a steering wheel, depression of the clutch pedal, accelerator and occasional brake. Additionally, the travel period is often defined by long periods of time standing in queues, racing along concourses or train stations, waiting at the bar in the airline lounge or a cafe, and sitting or sleeping in a chair with limited scope for adjustment or cushioning. There is the ever present concern over Deep Vein Thrombosis (DVT), a common entry in the ‘Travellers list of things that can ruin your fun’. For a thorough examination of the travel phase an extended amount of movement was considered. Planes, Trains and Automobiles (the latter otherwise known as cars) were acquisitioned for the experiment. The hours consumed in these activities is listed in table 1. Table 1. Conveyance methods and time consumption. Phase two reflected the typical excavation. Excavation often requires short periods of walking, kneeling, lots of standing, lots and lots of squatting, more standing, scraping, scratching, praying, and occasional leaps of joy. A three week period was considered a reasonable amount of time to conduct the test. Over this time it would be reasonably expected numerous days of wearing between washings would occur. On those occasions washing was actually conducted this would comprise hand washing in the hotel basin, or if available a laundry facility. Dry cleaning was not considered as this expense often results in a reduction of the dinner wine budget; considered an essential field component by many. Using the hotel room bidet, although an accepted practice, was not tested as this can be considered similar to hand washing. A spa bath was not available for trial, so shrinkage after a hot water wash was not tested. Wearing socks in swimming pool was considered a non-typical field example, and downright silly. Phase three reflected the archaeological survey. Survey work consists of short periods of sitting. This sitting invariably follows significant periods of walking, the occasional stumble, and leaping to attract the attention of another team member. The distance covered on a good walk has been known to require unfolding a second map, or at least turning the first one around the right way. Often tape measures and a compass form the technological component of survey work. Specialists insist on paper and writing implements. On a well-financed project a Global Positioning System (GPS) device can be part of the surveyor’s kit. One was available for the purposes of this field work (refer figure 1.). The additional weight carried by the wearer impacts heavily on the wear rates of the socks. Within phase 2 and 3 many hours were allocated to laboratory work. This did not adversely impact the wear of the socks, but was still considered necessary as a sample of the typical field work environment. Hours were not logged as there were other important things to do. Two pairs of socks were selected for testing. This ensured a continuous supply of sock with the additional benefit of a pair of hand warmers should the need arise. Testing was conducted throughout June and July 2012 in the northern and southern hemispheres. Temperatures experienced throughout the experiment ranged from 9o C to 40o C. Some precipitation was encountered throughout the testing period; however, it was difficult to determine if this was due to rain or sweat. The olfactory assistant refused to examine the socks when requested, citing psychological concerns. Washing was by hand (with or without soap as circumstances dictated), or in a tumble washer. Drying was conducted by the Sol and Ventus tm evaporative process. Sol and Ventus tm was selected as it is a universally accepted practice, is free to use and is available under open source license. Various footwear types were worn throughout the experiment. These were predominately shoes, or occasionally just the sock. Thongs (or flip flops if you find that term awkward), and sandals were not considered for reputation reasons. A lot of excavation was performed in trying conditions. The survey work ensured great distances were covered. Figure 1. 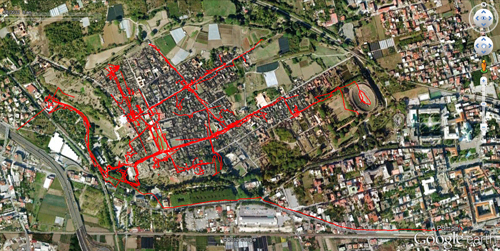 Sample of distances walked during the survey phase (3) of experiment while wearing Archsocks. Red lines indicate 3 days of GPS track. These lines are legitimate. Image courtesy Google Earth 2012. Comfort was measured by how happy the wearer was at the end of the work day and how prepared they were to wear the socks another day, or three. At no time were there any qualms about wearing the socks. Auditory response from the user indicated a positive acceptance. Durability was measured by the number of holes in the sock at the end of the complete experiment. It must be noted that all socks require at least one hole as this is part of the manufacturing process and is considered essential for the useability of the sock. More rigorous testing would include measuring the width of material walls, twist unravel, fibre breakdown, thread breakage, and fading. But who has time for that? Only four holes were observed at the end of the experiment. One hole was found in each sock. As just noted this is to be expected, and these holes were present when items were received from manufacture. No DVT was recorded. No dogs took the socks. The wearer uttered no complaints of cold while wearing in the Australian winter. On one occasion the socks were worn for three days without washing due to logistical issues. This was considered an exception to the rule, and there were no observable objections raised by team mates. The thickness of the sock affords a great level of cushioning. In warmer temperatures this does not adversely affect the wearer. No blisters were formed throughout the experiment. Archsocks were not the only type of sock worn throughout the experiment. This was practical in terms of drying times, and also in consideration of other team members. They were the preferred clothing of choice after shirt, shorts and underwear. A single adult size was selected for testing. It is difficult to find feet small enough to fit in kid sizes on a worksite. Very little scientific method was employed in the experiment. The socks performed admirably. They are recommended for the serious field archaeologist who is concerned about their foot health or having happy feet. Dancing is encouraged in these socks. The socks are incredibly effective at picking up grass seeds. While initially an inconvenience, by the end of the field season there were few grass seeds left on site to continue to be an annoyance. They did offer prickle protection. Care should be taken with selecting sock sizes as this can be confusing. Should this occur the smaller sizes make great drink coolers, hand puppets, gifts, polishers and spillage wipes. I am sure, over time, many other uses will come to the fore. Are Archsocks the new cable tie? 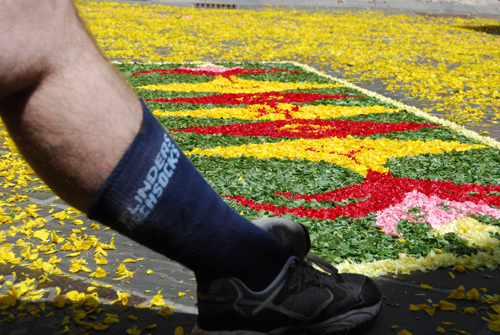 While further field testing would provide a greater level of confidence in the product, subsequent wearing of the socks since experimentation has shown continued durability. No new holes yet. You don’t tear off Archsocs. They come off nice and sloooow. Better still, they stay on for that sensual appeal. Unfortunately suitable beer laboratories weren’t available in Italy for the majority of the test. Hopefully a follow-up study performed locally will test the criteria you suggest. No, the REALLY crucial field component that you’ve missed (I expect to see a second phase of experimentation soon) is whether or not you can use one as a filter to make coffee in really rugged (i.e. more than 1 hour from a coffee shop) conditions … this is the thing that will determine their take up nationally by caffeinated archaeologists. Reminds me of how I filter my home brew.